Fix the coffee pot to brew automagically to be ready. Plan to drop the kids at school, tell the boss you’re taking time off, leave the dog at the kennel, whatever you need to do to clear your decks. The Virtual Fair is coming. Wednesday and Thursday of next week, the two-day, online, free Virtual Fair of the National Archives will take place, and you won’t want to miss a minute. From an introduction to Department of State records to the story of the Iwo Jima flag raisers (“Chaos, Controversy and World War II Marine Corps Personnel Records”), these are presentations every genealogist can learn from and use — and they’re all absolutely free. This two-day live event is on YouTube, all presented in real time and recorded. Viewers will have a chance to ask questions and interact with each other during the event (you can also follow and chat with other viewers on social media #GenFair2016), and all of the session videos and handouts will be available free. Registration isn’t required and you can either watch in real time or — if the boss is really unreasonable and insists that you work during the Fair hours — you can watch at your convenience later. 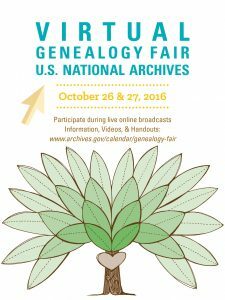 The information page for the 2016 National Archives Virtual Genealogy Fair is here and the YouTube channel here. Keep checking both for more information, handouts and more.